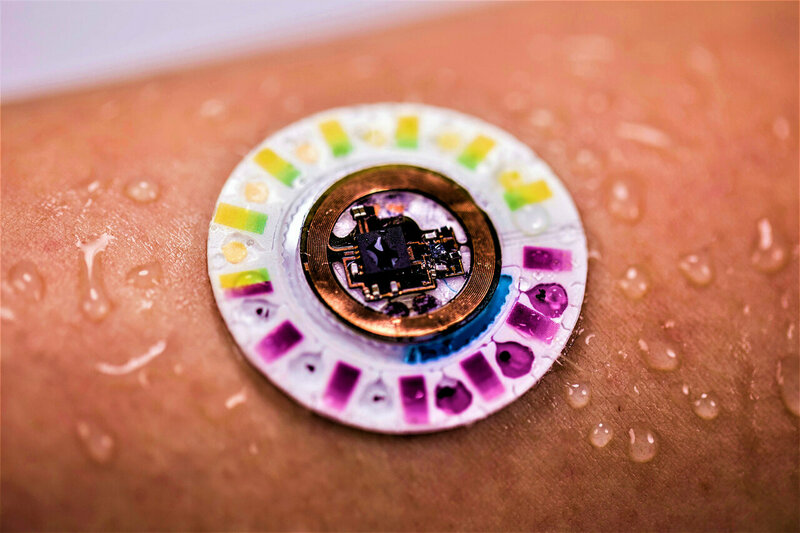 An international team of researchers has developed a skin patch that serves as a biomarker sensor—one that does not need batteries. In their paper published in the journal Science Advances,, the group describes the new device patch and how it works. 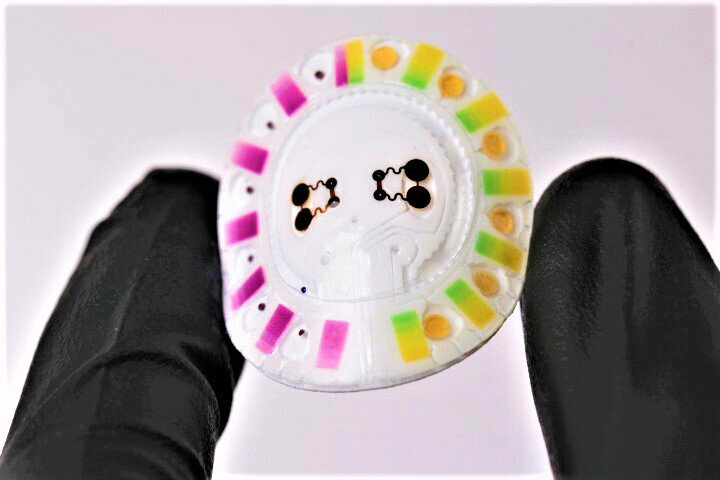 Biomarker sensors have become popularized by such devices as the Fitbit, but as the researchers note, they are typically bulky and only measure mechanical activities. 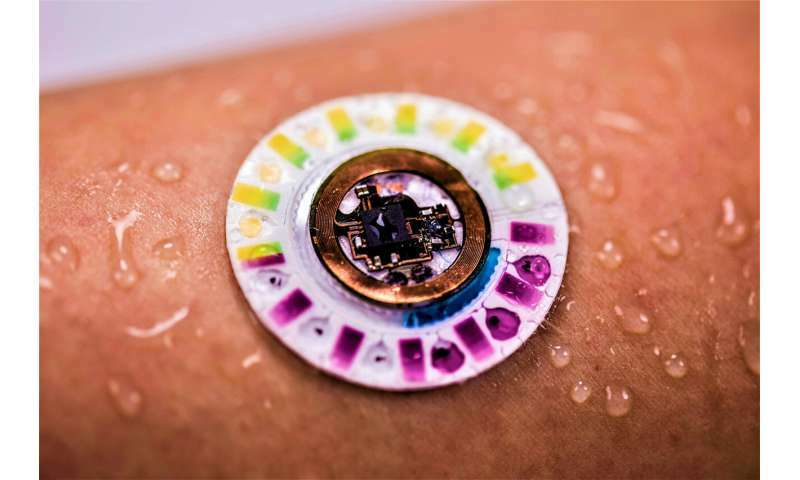 In this new effort, the researchers have created a device that measures biological processes at work in real time—a soft skin patch that detects information about the inner body by testing components of sweat. The patch has tiny holes that pull in sweat when it is attached to the skin. Samples of the sweat move naturally through micro-channels that lead to tiny collection chambers. Each of the chambers serves as an individual test site. One measures how much sweat has been produced, another tests pH levels by color changes. Others have chemical reagents that react with lactate or glucose. The components that need power get it from radio waves emitted from electronic devices such as smartphones. Likewise, data from the device can be read by a smartphone (using near-field communication technology) and converted to a form easily interpreted by the user or the doctors tending to them. The researchers note that elements in sweat include markers for things like cystic fibrosis, dehydration and electrolyte levels. 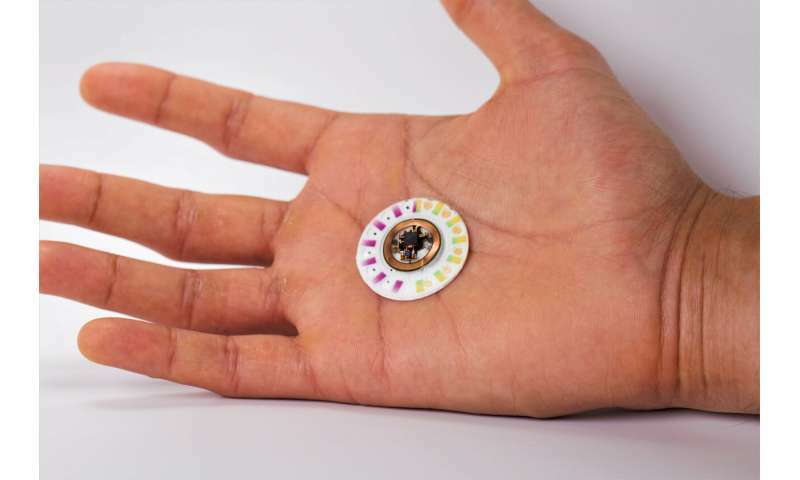 The patch could also provide athletes with a real-time test of how their body is holding up during competition. A patch format is considered more comfortable than devices that are strapped to the body, and they are therefore more likely to be used. Patches can also be used in almost any environment, including underwater. The researchers note that this makes them ideal for individualized systems dedicated to monitoring elements in the body that pertain to specific conditions for a given individual. They also note that the channel portion of the patch is disposable, which means the patch can be used multiple times, reducing costs.